Gytha depicted in modern stained glass. 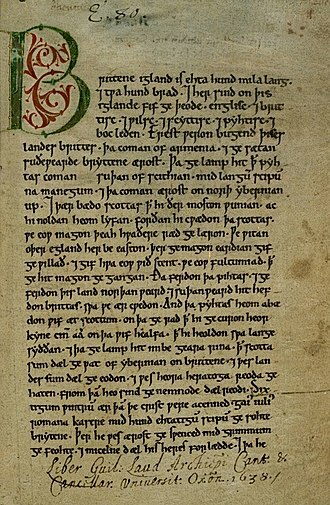 Gytha Thorkelsdóttir (Old English: Gȳða Þorkelsdōttir, c. 997 – c. 1069), also called Githa, was a Danish noblewoman. She was the mother of King Harold Godwinson and of Edith of Wessex, queen consort of King Edward the Confessor of England. 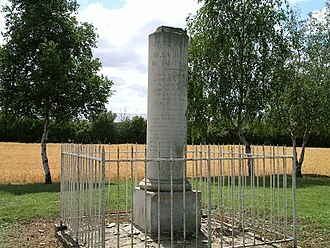 Two of their sons, Harold and Tostig, faced each other at the Battle of Stamford Bridge, where Tostig was killed. 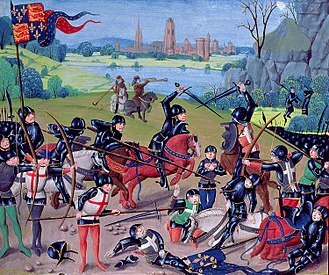 Less than a month later, three of her sons, Harold, Gyrth, and Leofwine, were killed at the Battle of Hastings. Shortly after the Battle of Hastings, Gytha was living in Exeter and may have been the cause of that city's rebellion against William the Conqueror in 1067, which resulted in his laying siege to the city. She pleaded unsuccessfully with him for the return of the body of her slain son, king Harold. 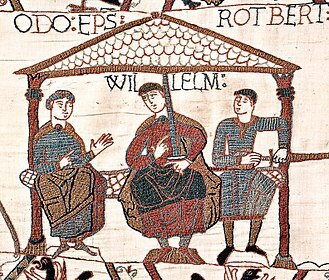 According to the Anglo-Saxon Chronicle, Gytha left England after the Norman conquest, together with the wives or widows and families of other prominent Anglo-Saxons, all the Godwin family estates having been confiscated by William. 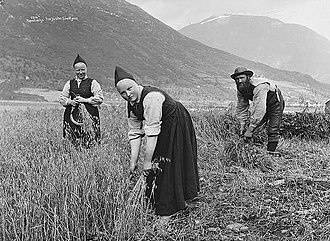 Little else is known of Gytha's life after that time, although it is probable that she went to Scandinavia where she had relatives. 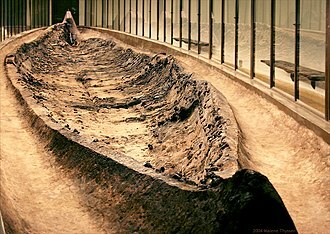 Her surviving (and youngest) son, Wulfnoth, lived nearly all his life in captivity in Normandy until the death of William the Conqueror in 1087. Only her eldest daughter, Queen Edith (d. 1075), still held some power (however nominal) as the widow of King Edward the Confessor. ^ Mercedes Rochelle (2014). "Gytha, wife of Godwine". Historical Britain. Retrieved April 1, 2016. ^ Late pedigrees make Thorgil the son of the disinherited Swedish prince Styrbjörn Starke, the conqueror of Jomsborg, and Tyra, the daughter of Harold Bluetooth king of Norway and Denmark. 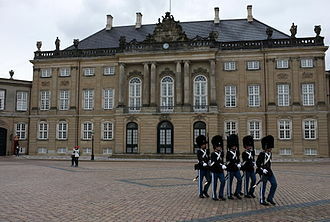 However, this descent from the old Swedish and Danish royal houses is believed to be a late invention to give her brother, the ancestor of later Danish kings, some claim to royal blood. ^ Hoskins, W. G. (2004). Two Thousand Years in Exeter (Revised and updated ed.). Chichester: Phillimore. pp. 25–26. ISBN 1-86077-303-6. William George Hoskins CBE FBA was an English local historian who founded the first university department of English Local History. His great contribution to the study of history was in the field of landscape history, Hoskins demonstrated the profound impact of human activity on the evolution of the English landscape in a pioneering book, The Making of the English Landscape. His work has had lasting influence in the fields of local and landscape history, William George Hoskins was born at 26–28 St Davids Hill, Devon on 22 May 1908, his father, like his grandfather, was a baker. He won a scholarship to Heles School in 1918, and attended the University College of South West England where he gained BSc and MSc degrees in economics by the age of 21, both his MSc in 1929 and his PhD in 1938 were on the history of Devon. The remainder of his life was devoted to university teaching and the authorship of historical works and he died on 11 January 1992 in Cullompton, Devon. Hoskins was appointed Assistant Lecturer in Commerce at University College, Leicester in 1931 and he found the trade statistics to be dull lecture material, but he enjoyed the evenings that he spent teaching archaeology and local history at Vaughan College. His academic researches covered historical demography, urban history, agrarian history and he became a member of the Leicestershire Archaeological Society in September 1935. After the award of his doctorate Hoskins was appointed Reader in English Local History at University College, in his obituary, this was stated to be generally acknowledged as a mistake. Hoskins was one of the founders of the Exeter Group in 1960 and he was president of the Dartmoor Preservation Association from 1962 until 1976. He became the first professor of history at the University of Leicester in 1965 when he was appointed Hatton Professor of English History. Hoskins wrote and presented a BBC television series Landscapes of England in 1976, Hoskins was awarded the Fellowship of the British Academy in 1969 and the CBE in 1971. He was made an Honorary Fellow of the Royal Institute of British Architects in 1973, the University of Exeter acknowledged his links with the city by conferring an honorary Doctorate of Letters upon him in 1974. G.
Scandinavia /ˌskændᵻˈneɪviə/ is a historical and cultural region in Northern Europe characterized by a common ethnocultural North Germanic heritage and mutually intelligible North Germanic languages. The term Scandinavia always includes the three kingdoms of Denmark and Sweden, the remote Norwegian islands of Svalbard and Jan Mayen are usually not seen as a part of Scandinavia, nor is Greenland, an overseas territory of Denmark. This looser definition almost equates to that of the Nordic countries, in Nordic languages, only Denmark and Sweden are commonly included in the definition of Scandinavia. In English usage, Scandinavia sometimes refers to the geographical area, the name Scandinavia originally referred vaguely to the formerly Danish, now Swedish, region Scania. Icelanders and the Faroese are to a significant extent descended from the Norse, Finland is mainly populated by Finns, with a minority of approximately 5% of Swedish speakers. A small minority of Sami people live in the north of Scandinavia. 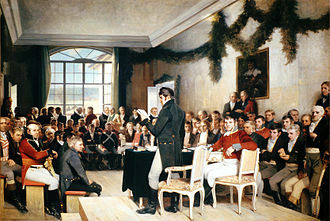 The Danish and Swedish languages form a continuum and are known as the Scandinavian languages—all of which are considered mutually intelligible with one another. Faroese and Icelandic, sometimes referred to as insular Scandinavian languages, are intelligible in continental Scandinavian languages only to a limited extent, Finnish and Meänkieli are closely related to each other and more distantly to the Sami languages, but are entirely unrelated to the Scandinavian languages. Apart from these, German and Romani are recognized minority languages in Scandinavia, the southern and by far most populous regions of Scandinavia have a temperate climate. Scandinavia extends north of the Arctic Circle, but has mild weather for its latitude due to the Gulf Stream. 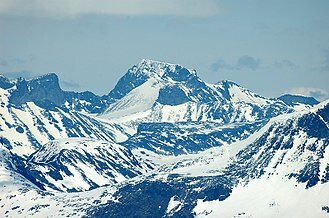 Much of the Scandinavian mountains have a tundra climate. 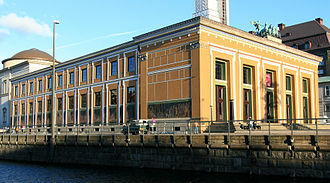 There are many lakes and moraines, legacies of the last glacial period, Scandinavia usually refers to Denmark and Sweden. Some sources argue for the inclusion of the Faroe Islands and Iceland, though that broader region is known by the countries concerned as Norden. An earl /ɜːrl/ is a member of the nobility. The title is Anglo-Saxon in origin, akin to the Scandinavian form jarl, in Scandinavia, it became obsolete in the Middle Ages and was replaced by duke. In medieval Britain, it became the equivalent of the continental count, earlier in Scandinavia, jarl could mean a sovereign prince. 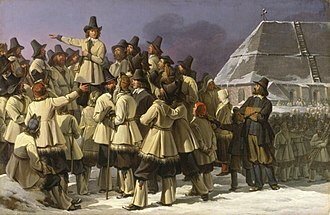 For example, the rulers of several of the petty kingdoms of Norway had the title of jarl, alternative names for the rank equivalent to Earl/Count in the nobility structure are used in other countries, such as the hakushaku of the post-restoration Japanese Imperial era. In modern Britain, an earl is a member of the peerage, ranking below a marquess, a feminine form of earl never developed, countess is used. The term earl has been compared to the name of the Heruli, proto-Norse eril, or the Old Norse jarl, came to signify the rank of a leader. 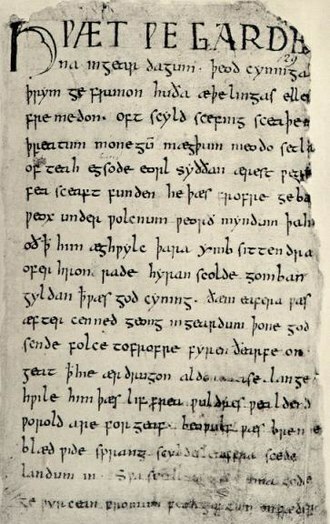 The Norman-derived equivalent count was not introduced following the Norman conquest of England though countess was and is used for the female title. In the other languages of Britain and Ireland, the term is translated as, Welsh iarll and Scottish Gaelic iarla, Scots yarl or yerl, Cornish yurl. 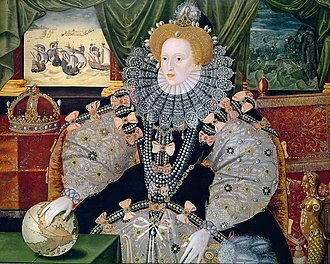 An earl has the title Earl of when the title originates from a placename, in either case, he is referred to as Lord, and his wife as Lady. A countess who holds an earldom in her own right uses Lady, younger sons are styled The Honourable, and daughters, The Lady. In the peerage of Scotland, when there are no courtesy titles involved, the heir to an earldom, and indeed any level of peerage, is styled Master of, and successive sons as younger of. 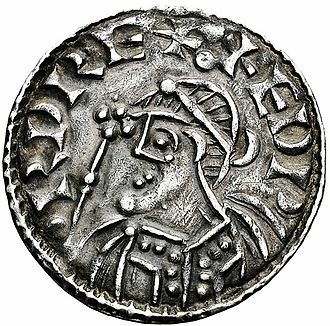 In Anglo-Saxon England, earls had authority over their own regions and right of judgment in provincial courts and they collected fines and taxes and in return received a third penny, one-third of the money they collected. In wartime they led the kings armies, some shires were grouped together into larger units known as earldoms, headed by an ealdorman or earl. Under Edward the Confessor earldoms like Wessex, East Anglia, Earls originally functioned essentially as royal governors. Herefordshire is a historic English county in the West Midlands. It is a county and a unitary non-metropolitan county and district, named in legislation as the County of Herefordshire. The Welsh unitary county covering the part of Gwent next to Herefordshire is Monmouthshire, Hereford is a cathedral city and is the county town, with a population of approximately 55,800 inhabitants it is the largest settlement. 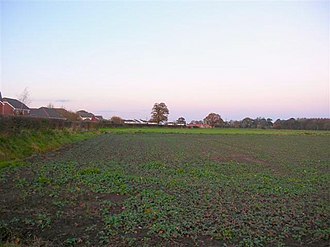 The county is one of the most rural and sparsely populated in England, the land use is predominantly agricultural and the county is well known for its fruit and cider production, and the Hereford cattle breed. From 1974 to 1998, Herefordshire was part of the former county of Hereford. Herefordshire was reconstituted both as a new district and as a new county by Statutory Instrument as defined in The Hereford and this Order established Herefordshire as a unitary authority on 1 April 1998, combining county and district functions into a single council. Herefordshire is called a unitary district, but this is not official nomenclature. Herefordshire is officially known as an authority for local government purposes. The Lieutenancies Act 1997 made Herefordshire a ceremonial county, covering the area of the unitary district. For Eurostat purposes it is a NUTS3 region and is one of three counties that comprise the Herefordshire and Warwickshire NUTS2 region. The River Wye, which at 135 miles is the fifth-longest in the United Kingdom and it flows through both Hereford and Ross-on-Wye before returning to Wales. Leominster is situated on the River Lugg, a tributary of the Wye, there are two Areas of Outstanding Natural Beauty in the county. The Wye Valley is located in the valleys south of Hereford, while the Malvern Hills are in the east of the county. Herefordshire is one of the 39 historic counties of England, in 1974 it was merged with neighbouring Worcestershire to form the Hereford and Worcester administrative county. Within this, Herefordshire was covered by the government districts of South Herefordshire, Hereford. However, the county was dissolved in 1998, resulting in the return of Herefordshire and Worcestershire as counties, the current ceremonial county and unitary district have broadly the same borders as the pre-1974 historic county. 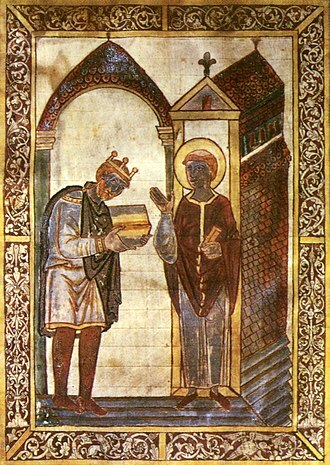 Harold Godwinson, often called Harold II, was the last Anglo-Saxon king of England. 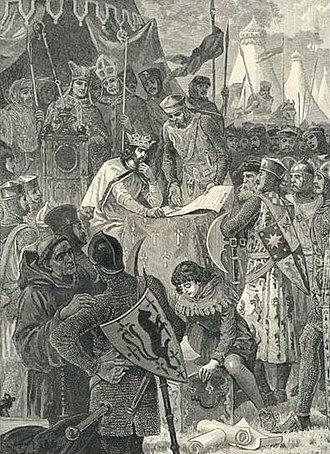 Harold reigned from 6 January 1066 until his death at the Battle of Hastings on 14 October and his death marked the end of Anglo-Saxon rule over England. 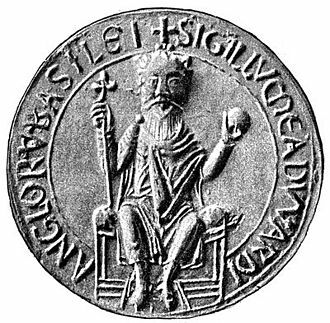 Harold was an earl and member of a prominent Anglo-Saxon family with ties to Cnut the Great. 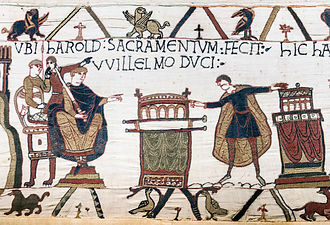 Upon the death of Edward the Confessor in January 1066, the Witenagemot convened and chose Harold to succeed, he was crowned in Westminster Abbey. 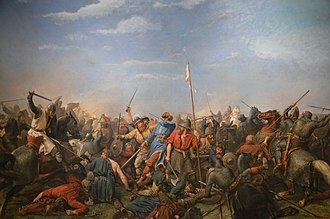 In late September, he repelled an invasion by rival claimant Harald Hardrada of Norway before marching his army back south to meet William the Conqueror at Hastings some two weeks later. Harold was a son of Godwin, the powerful Earl of Wessex, gythas brother was Ulf the Earl, who married Cnuts sister Estrith. This made Ulf the son-in-law of King Sweyn Forkbeard, Godwin was the son of Wulfnoth, probably a thegn and a native of Sussex. 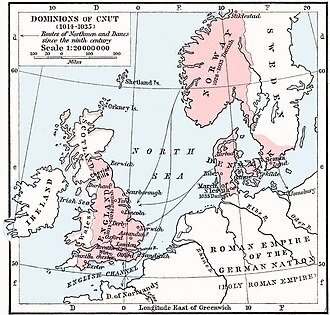 Godwin began his career by supporting King Edmund Ironside, but switched to supporting King Cnut by 1018. Godwin remained an earl throughout the remainder of Cnuts reign, one of two earls to survive to the end of that reign. Harthacnuts death in 1042 probably involved Godwin in a role as kingmaker, in 1045 Godwin reached the height of his power when the new king married Godwins daughter Edith. Godwin and Gytha had several children – six sons, Harold, Gyrth and Wulfnoth, the birthdates of the children are unknown, but Sweyn was the eldest and Harold was the second son. 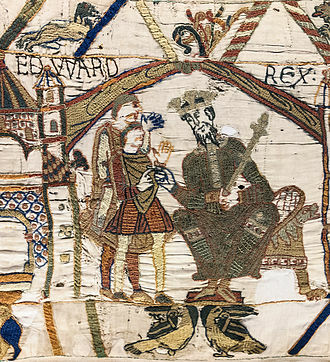 Harold was aged about 25 in 1045, which makes his birth year around 1020, Edith married Edward on 23 January 1045 and, around that time, Harold became Earl of East Anglia. 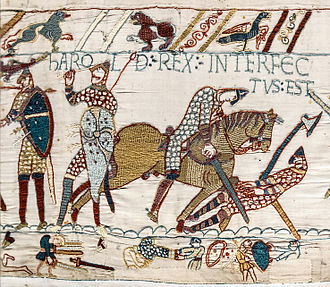 Harold is called earl when he appears as a witness in a will that may date to 1044, one reason for his appointment to East Anglia may have been a need to defend against the threat from King Magnus the Good of Norway. It is possible that Harold led some of the ships from his earldom that were sent to Sandwich in 1045 against Magnus, Harolds elder brother, had been named an earl in 1043. A prince is a male ruler, monarch, or member of a monarchs or former monarchs family. Prince is a title in the nobility of some European states. The feminine equivalent is a princess, the English word derives, via the French word prince, from the Latin noun princeps, from primus + capio, meaning the chief, most distinguished, prince. The Latin word prīnceps, became the title of the informal leader of the Roman senate some centuries before the transition to empire. Emperor Augustus established the position of monarch on the basis of principate. The term may be used of persons in various cultures. 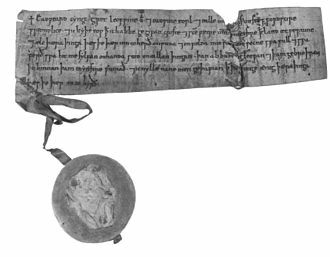 These titles were borne by courtesy and preserved by tradition, not law, in medieval and Early Modern Europe, there were as many as two hundred such territories, especially in Italy and Gaelic Ireland. In this sense, prince is used of any and all rulers and this is the Renaissance use of the term found in Niccolò Machiavellis famous work, Il Principe. Most small territories designated as principalities during feudal eras were allodial and this is attested in some surviving styles for e. g.
British earls and dukes are still addressed by the Crown on ceremonial occasions as high, in parts of the Holy Roman Empire in which primogeniture did not prevail, all legitimate agnates had an equal right to the familys hereditary titles. Gradual substitution of the title of Prinz for the title of Fürst occurred. Both Prinz and Fürst are translated into English as prince, but they not only different. This distinction had evolved before the 18th century for dynasties headed by a Fürst in Germany, note that the princely title was used as a prefix to his Christian name, which became customary. 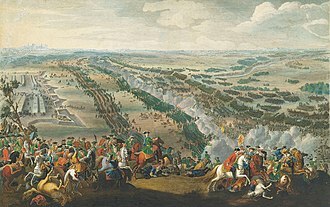 Cadets of Frances other princes étrangers affected similar usage under the Bourbon kings, the post-medieval rank of gefürsteter Graf embraced but elevated the German equivalent of the intermediate French and Spanish nobles. 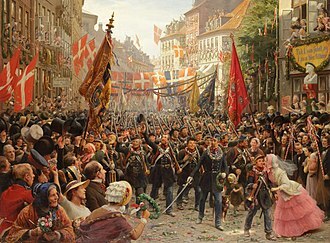 By the 19th century, cadets of a Fürst would become known as Prinzen, the husband of a queen regnant is usually titled prince consort or simply prince, whereas the wives of male monarchs take the female equivalent of their husbands title. Clockwise: The Cathedral, The Clock Tower, Devon County Hall, Cathedral Close, The Iron Bridge. A portion of Exeter's city wall, formed of both Roman and medieval stones. The River Wye near Ross-on-Wye. Hereford Cathedral. Owing to its cathedral, Hereford is a city; the only one in Herefordshire. 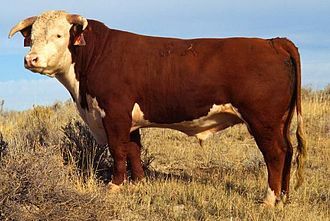 Hereford cattle, such as this bull, originated in the county and are now bred throughout the world. Edgar Street is the home ground of Hereford F.C., the successors to Hereford United, the only club from the county to have ever played in The Football League. Cicero attacks Catiline in the Senate of the Roman Republic. Louis de Bourbon, Prince de Condé, was the premier prince du sang during his lifetime (painted by Joost van Egmont). José, Prince of Brazil, Duke of Braganza, died before he could ascend to the throne of Portugal. Coat of arms of the princes Sanguszko-Lubartowicz (Poland). In The Making of the English Landscape, Hoskins explains features like the distinctive ridge and furrow pattern in open field system farming, seen here at Wood Stanway, Gloucestershire. Modern memorial in Wolin, the most probable site of medieval Jomsborg. 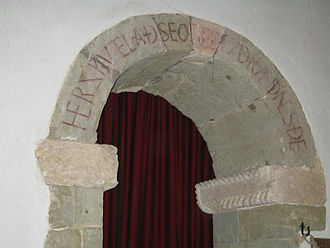 The Danish and Polish inscription, held in rune style, commemorates the death of Harald Bluetooth in Jomsborg, 986.